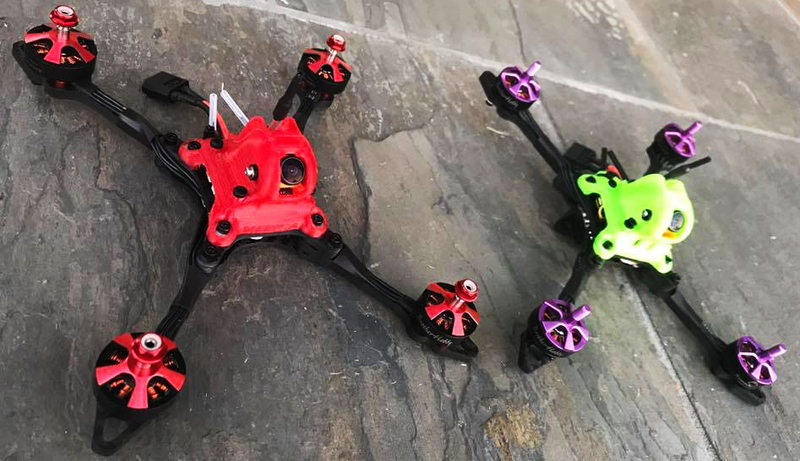 WHY DID WE DECIDE TO CALL THIS PINNACLE OF FPV RACING TECHNOLOGY THE "MERICA"? BECAUSE CATALYST MACHINEWORKS IS LUCKY ENOUGH TO BE BASED IN THE GREATEST COUNTRY ON PLANET EARTH. ARE WE RIDICULOUSLY PROUD OF THE USA? HECK YEAH WE ARE! CAN YOU SMELL ALL THAT FREEDOM AND LIBERTY? SMELLS DELICIOUS, LIKE APPLE PIES AND HOT DOGS! THANKS TO ALL OUR US MILITARY SERVICE MEN AND WOMEN WHO FIGHT TO KEEP US FREE. SOME OF WHICH HAVE GIVEN THEIR LIVES TO PROTECT US. THIS FRAME WAS NAMED IN YOUR HONOR. At only $69.99 (after canopy purchase) you are getting a TON of features and racer inspired technology. You get what you pay for and MORE! Replacement 5mm arms are only $4.50 each. Replacement 6mm arms are only $5.50 each. This frame uses an aerodynamically efficient arm design that is thin without sacrificing crash durability. Standard with the kit are 5mm thick arms and optional 6mm thick arms can be be purchased as an upgrade. Arm design is not the only contributing factor for great aero. You also need a 'slippery' center fuselage that gives as little resistance to the oncoming air as possible. 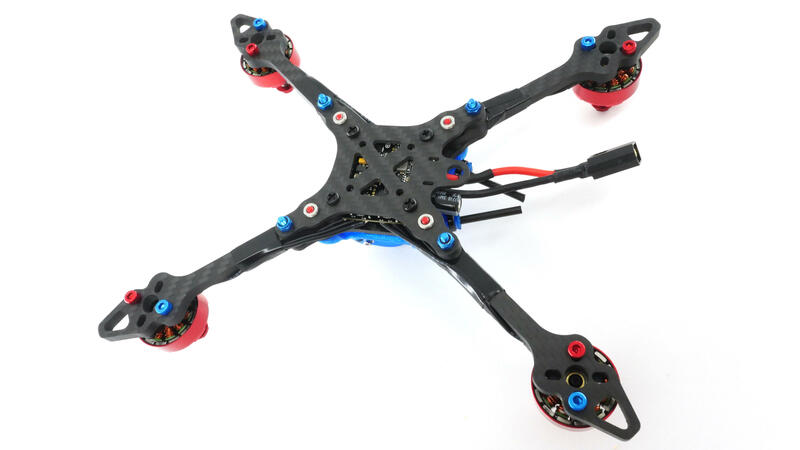 Merica's 'head' is a TPU canopy that is designed to have a very low drag coefficient. The flight controller and FPV camera are mounted to the TPU canopy. You read that correct. The FC is NOT mounted to the carbon fiber frame. Mounting the FC to the TPU canopy means that any board you choose is soft mounted by default. The canopy is made of a flexible material and works to de-couple the board from the motors. The FPV camera is mounted at the top of the canopy. This mounting scenario helps to dampen vibration before it reaches your camera. Plenty of space to fit 'standard sized' components with 30.5mm x 30.5mm mounting holes. 4-in-1 ESC's are ideal with this frame. AIO FC/ESC/PDB's such as the Asgard can be used as well. There are also 20mm x 20mm mounting holes for micro AIO ESC's, and with THIS adapter you can mount in a micro FC. The Merica comes standard with high quality 5mm thick arms with optional 6mm thick arms available for purchase. Carbon fiber grain direction in aligned with the length of the arm for maximum crash toughness and rigidity. The entire top section of the frame is a flexible TPU canopy. During a crash this structure will move and give instead of breaking like a carbon fiber top plate. This frame takes the stretch X design even farther and staggers the front and rear arms with respect to each other. The front arms sit at a lower elevation than the rear which helps to get more 'clean air' to the rear props. Last edited by Catalystmachine; Oct 04, 2017 at 06:09 AM. I love the Catalyst Machineworks frames! Every one has such attention to detail. The Merica is definitely my new favorite frame! From his reaction after flight and seeing how well the quad handled i bought two more for myself. I've got 2- 4" Mericas and they are the best race quad I've flown. Loved the last 2 race versions but this one is just on a different level. Awesome frame, i bought two for my son and he loves it. I just bought two more this morning. Really enjoyed the frame and how it flys. Here is a short clip of my sons Merica Maiden flight. Flying my Merica 5" prototype since August. So far I broke 1 arm due to repeated impacts at high speed. Canopy won't accept the split as it was designed for the micro swift or foxeer micro. Nice to see a thread for the ‘Mercia here! I got mine all finished and flew a few packs. I love it so far. I’m gonna need a few more packs to get confortable with it, it’s the fastest thing I’ve ever flown. Can’t wait to get more air time with it. Not sure of the weight, don’t think it’s the lightest but it sure is fast. By the way guys we are in the middle of prototyping a GoPro Session mount for this bird. Same setup will fit all sizes of the frame from 3" up to 6". Not that you would strap a session to a 3" but hey I have seen crazier things. Here is a video from today's test of the prototype mount / canopy. Just built mine a couple weeks ago. Have to say the build was simple and I love the layout. When all said and done weight without battery was 230g. Compared to what I was flying before that's almost half. This thing fly's on rails and is a rocket ship. Actually think f40III are to much motor but I'm loving it. Great job guys!!! Love my 5" Merica. Build was super easy with the downloadable step by step instructions, even for a noob like myself. Best flying quad I've ever flown. I like it so much I've ordered a second one. The folks at catalyst machineworks took time to answer all my questions and helped point me in the right direction for my build. They really do have the best customer service out there. Last edited by SkullNDrones; Oct 03, 2017 at 05:15 PM. PSA FOR THE MERICA 5": This frame is back in stock and shipping beginning today. As always we continue to improve our products and make changes based on our own testing and customer input/requests. We have updated the arm and arm brace design to accept motors using mounting screws existing at both 16mm and 19mm diameter, not just 16mm. So this means all frames shipped starting TODAY receive this new design. Please be aware we will not exchange out parts if you have the old design. Sorry, but that is the price of progress! However, the new design parts are available in our spare parts section. Got some pics completed of our 3" Merica, which can also fit 3.5" props I will point out! And of course: Merica, F*ck Yeah!!! Last edited by Brainstorm; Oct 11, 2017 at 07:01 PM.